As the nations of the world gather in Poland for the latest round of climate change negotiations, the imperative to reduce emissions grows ever stronger. Disruptive consumer innovations have an essential part to play – from shared mobility and smarter homes to peer-to-peer trading and apps for reducing food waste. SILCI project researchers are asking: What is the transformative potential of disruptive consumer innovations towards a low-carbon future? SILCI stands for Social Influence and disruptive Low Carbon Innovations. This bulletin has links to some of the highlights from the SILCI project over the past two years. You can find out more on our website where you can also sign up to stay in touch with the project over the next two years. You can download the bulletin in .pdf format here. 1. A scenario for meeting the 1.5oC target without negative emission technologies: journal article in Nature Energy. 2. Transforming energy demand to limit warming to 1.5oC: video of public lecture at the University of British Columbia. 3. 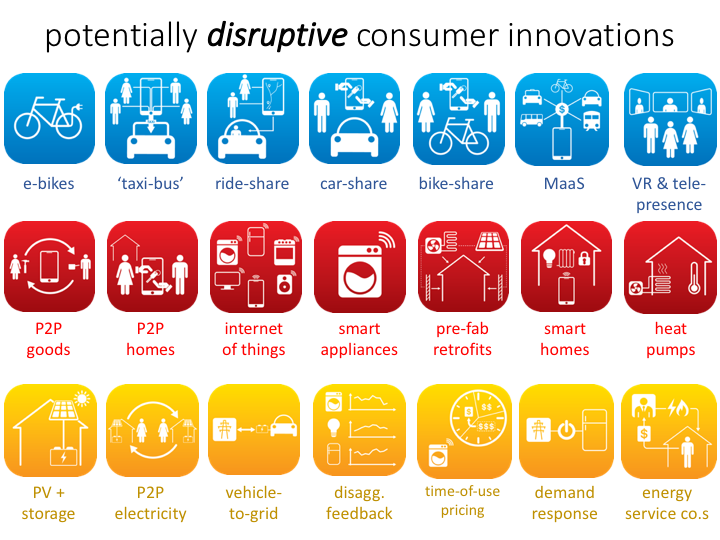 Disruptive consumer innovations for accelerated transformation: slides from seminar presentation at the International Energy Agency. 4. Options and policies for disruptive low-carbon innovation: report from experts’ workshop in London. 5. What consumers can do to reduce their carbon footprint: radio interview on the CBC in Canada. The SILCI project team tracks potentially disruptive innovations in multiple domains including mobility, food and homes. You can find a ton of posts on what we think are exciting developments across these domains in the ‘Topics‘, ‘News‘, ‘Events‘, and ‘Links‘ sections of our website. Here are quick links to some of our favourites. 1. 2018 the year of multi-modality. How much do we know about multi-modality? 2. The future of urban transportation. Mobility initiatives termed ‘ACES’ can shape the future of transport. 3. Driverless vehicle trials on track. Major ‘smart road‘ trials to begin soon. 1. Challenging the supermarket. Will digital technologies change the way we buy food? 2. Redefining ‘local’ food. Tomatoes can be grown on roofs! 3. Would you eat cultured meat? Lab-grown chicken and beef could be available soon. 1. Who shares and why? Growth of the sharing economy. 2. Plant – based diets and car – free lifestyles. High impact, individual actions for reducing carbon emissions. 3. Trade your solar power with your neighbours. The promise of peer – to – peer electricity networks. In the coming months, we’ll be releasing new findings from in-depth consumer behaviour research, cross-national surveys, social network analyses, and urban-scale modelling. We’ll send out occasional bulletins a few times a year to keep you informed with what we’ve found. Make sure you sign up on our website to stay in touch! If you don’t want to receive any future bulletins, just let us know at info@silci.org and we’ll remove your details from our website. And for anything else, just get in touch.